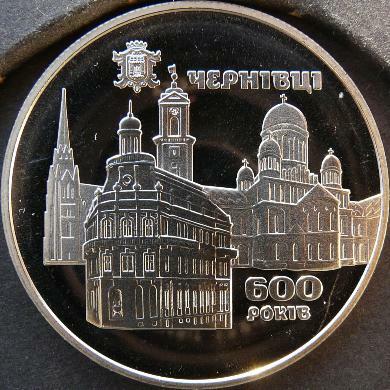 This coin was issued by the National Bank of Ukraine for the celebration of 600 years from the first mentioning of Cernăuţi (German name: Czernowitz; Ukrainian name: Chernivtsi). 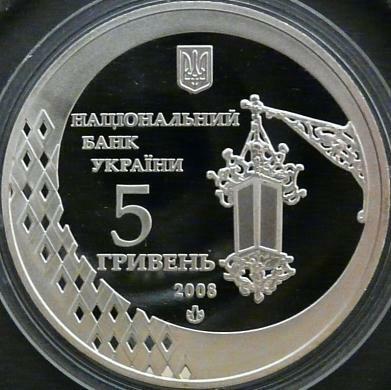 The coin belongs to the "Old Cities of Ukraine" series. This coin appears on Romanian coins because Cernăuţi belonged to the Principality of Moldavia for several hundred years (since the foundation of the principality) and because the town was one of the greatest Romanian cultural centers. The town of Cernăuţi is linked to the name of the greatest Romanian poet Mihai Eminescu: the poet lived and learned here for several years. At that time Moldavia exported livestock (oxen, cows, horses, sheep, pigs), rawhides and tanned leathers, fox and squirrel furs. 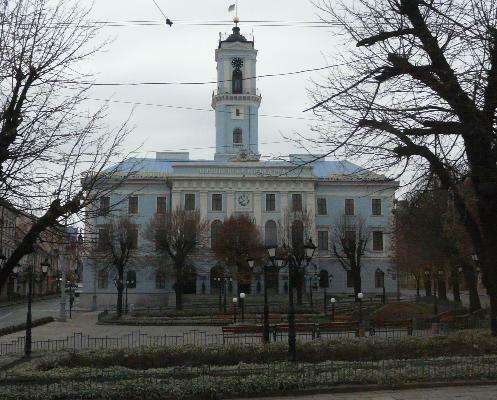 Several merchandises - good Moldavian horses, marten furs, silver - were under the monopoly of the ruler. Moldavia imported manufactured goods: cloths (caps, trousers) and fabrics, footwear, weapons, and exotic goods, called "Tartarian goods" because they came from the East: silk, pepper, incense, sweet Greek wine. Several goods only passed through Moldavia, being sold in other countries. - the former metropolitan residence, nowadays belonging to the Faculty of Theology; in this building the Romanian National Council organized the General Congress of Bucovina that voted on November 15th - old style / November 28th - new style "Unconditional and eternal Union of Bucovina in its old boundaries over to Ceremuş, Colacin and Nistru, with the Kingdom of Romania". 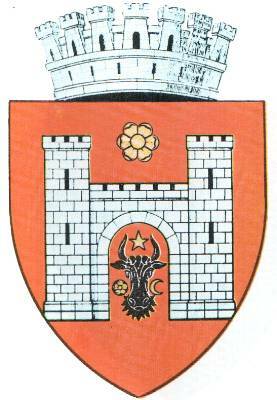 The Official Gazette number 171 from August 2nd 1930 shows that the coat of arms of the city of Cernăuţi is a silver stronghold with two squared towers. The windows of the stronghold are black. Into the stronghold's porch lies an aurochs head with star between horns and flanked by rose and crescent. Above the stronghold lies a golden rose. The shield is adorned with a silver mural crown with seven crenulated towers. The stronghold represented on the coat of arms is the old Ţeţina fortress near Cernăuţi. Abandoned somewhere in the 15th century, the fortress does not exists nowadays. The construction stones were used by the Austrian authorities for erecting buildings in Cernăuţi. The ruins of the last tower were destroyed during the Soviet occupation of the region. The aurochs head shows that Cernăuţi is an old Moldavian town.